Is it the HAL we always wanted? 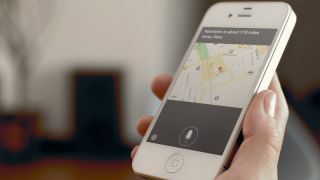 Siri could be moving into our homes full time, as Apple has plans for an always-listening smart dock. The dock, patented by Apple, is referred to as a device that is always listening to its surroundings so it can activate "a voice recognition mode of a portable electronic device." One of the headline features of the Moto X is that the phone is always listening, meaning you don't have to wake it up. It sounds like Apple's idea will work in a similar way, albeit through the smart dock and not the iPhone or iPad itself. According to the patent, the user will be able to assign a specific phrase or noise (such as a clap) to get the dock's attention when it's in listening mode. It'll then notify the device and activate Siri so you can have it do your bidding. The dock can also handily filter out ambient noise while still picking up your voice. This could be another patent filing that never sees the light of day, but it's yet more evidence that Apple has its sights sets on our living rooms. Hurry up with that iTV though, yeah? The iPad Air is super slim, but is it super good?